Portioning at room temperature allows you complete freedom in the choice of portioning room. For maximum temperature safety and a continuous cooling chain, the convection-cooled food distribution conveyor by BLANCO Professional is on hand to help – the premier class of portioning at normal room temperature. The cooled air curtain keeps the food on the conveyor at an ideal temperature even during portioning, thus guaranteeing continuous compliance with HACCP regulations. The cooling stations for shelf trolleys or universal dispensers provide a powerful addition, even for large amounts of food or dishes. With integrated convection cooling or connected to a customer-supplied refrigeration system, they are perfect for cooling dishes and keeping food and dishes cold on the conveyor. Instead of the dispensers with cooling slits, you use the central cooling station with matching ZKS universal dispensers. They offer reliable dish cooling and refrigeration of pre-portioned food. 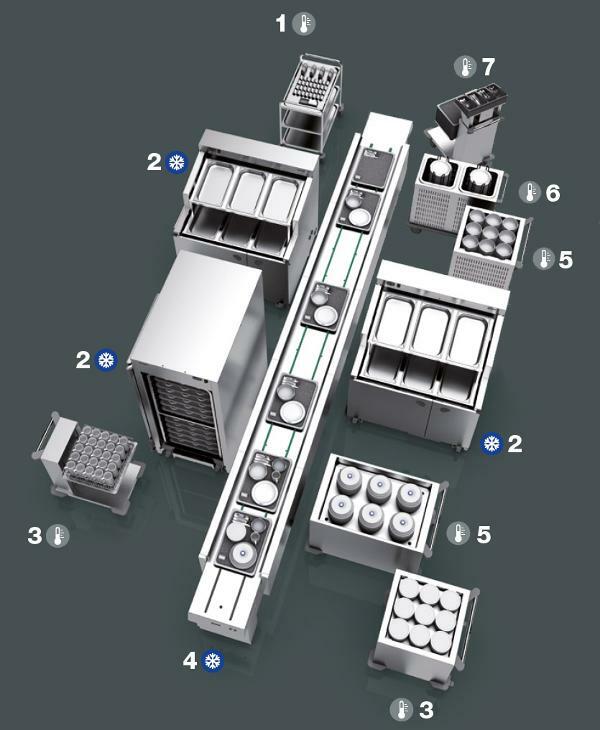 The indirectly cooled universal dispensers then transport the dishes for destacking or the pre-portioned food to the conveyor.